The Heathkit SB-620 Panadapter is compatible with various receiver IF frequencies and connects to the plate lead on the receiver mixer tube socket using a 7.5-12pf capacitor. If the receiver has multiple mixers, use the one which as the variable oscillator attached (VFO/LMO/PTO, etc). For IF selection options, the SB-620 Panadapter uses a number of different coils, resistors, capacitors, etc. Specific combinations are covered in charts in the manual and here are the Heathkit instructions in ".pdf" format. There are several different capacitor/resistor and wiring changes depending on the IF frequency selected. Refer to the assembly instructions in the manual. The purpose of this section is to focus on the more popular 455Khz IF and the 3395Khz Heathkit IF coils which are the most difficult items to locate. 40-590 is a 350Khz trap. It's on a 1/4" paper coil form with slug adjustment. The inductance range is 360uH to 500uH. The coil is not tapped and should be relatively simple to make. 40-775 is an osc coil (L3). It's on a 1/4" paper coil form with slug adjustment. This is a tapped coil which measures 286uH max across the entire coil (pin 1 to pin 3) and 118uH min. The measurement from the grounded end (pin 1) to the tap (pin 4) ranges from 18uH max to 7uH min. 40-776 is an osc coil (L3). It's on a 1/4" paper coil form with slug adjustment. This is a tapped coil which measures 32uH max across the entire coil (pin 1 to pin 3) and 12uH min. The measurement from the grounded end (pin 1) to the tap (pin 4) ranges from 1.4uH max to 0.6uH min. 40-807 is an osc coil (L3). It's on a 1/4" paper coil form with slug adjustment. This is a tapped coil which measures 7.6uH max across the entire coil (pin 1 to pin 3) and 3.3uH min. The measurement from the grounded end (pin 1) to the tap (pin 4) ranges from 1.4uH max to 0.7uH min. 40-808 is an osc coil (L3). It's on a 1/4" paper coil form with slug adjustment. This is a tapped coil which measures 61uH max across the entire coil (pin 1 to pin 3) and 23uH min. The measurement from the grounded end (pin 1) to the tap (pin 4) ranges from 5.5uH max to 2.2uH min. 45-33 (RFC1) is a peaking coil used for 455Khz only and measures 304uH. The construction manual shows 304uH and 304mH but that's an error. 52-101 is a bandpass coupling transformer. It's on a 3/16" paper coil form with NO slug adjustment. 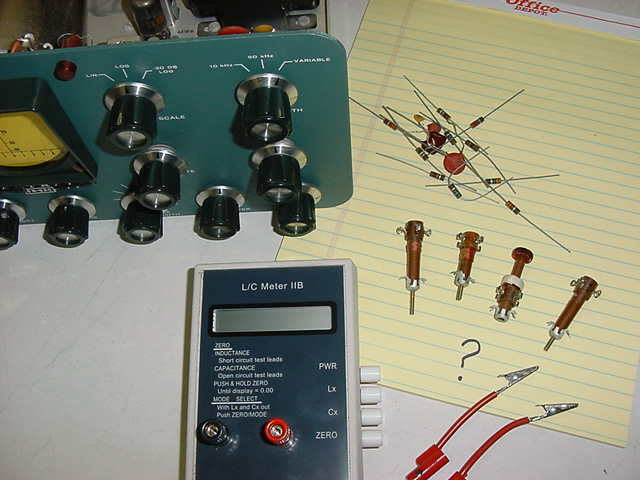 The two coils appear to be made using T-37-2 toroids (red, permeability of 10) with around 62 turns of #32 wire on them. Both toroids are wound in the same direction and are wired in series. The tap is where the first coil "out" is connected to the second coil "in". The two toroids are spaced 5/8" apart on the paper coil form. The inductance of each toroid is 18.1uH. This particular coil should be relatively simple to make. I don't believe the dimensions are all that critical and would try a T-44-2 toroid or even a T-50-2 toroid on a 1/4" paper coil form, if that is what you have available. The math (inductance,turns,wire size) works out correctly for a T-37-2. Good luck ! The osc coils should be the most difficult to make because of tap selection (how many turns from the grounded end of the coil). Don't assume the inductance ratio is the same as the turns ratio on these small criss-cross wound coils. Curiosity got the better of me and I unwound the 40-807 coil. Total number of turns is 18-1/2 and the tap is located 7-1/4 turns from the grounded end. No, I can't afford to unwind any others.